• ANZUS Plowshares - Moana Cole, Susan Frankel, Ciaron O' Reilly & Fr. Bill Streit disarm B-52 Bomber at Rome Air Force Base, New York, USA, on eve of Gulf War 1 - Jan 1st. '91 Plane grounded for 2 months. USAF estimate damage at $U.S.100,000 - sentenced to a year in prison. • BAe Ploughshares - Chris Cole disarms European Fighter Aircraft, Hawk Strike Attack Aircraft & military equipment destined to East Timor & Northern Ireland at BAe Stevenage, Herts., England on Jan 6th. 1993.Police estimate £300,000. Sentenced to 8 months imprisonment. • Seeds of Hope/East Timor Ploughshares - Lotta Kronlid, Andrea Needham, Jo Wlson & Angie Zelter disarm BAe Hawk Fighter in Indonesian Air Force markings on eve of intended export to Indonesian military at war on East Timor at BAe Warton, Lancashire on January 29th. 1996. Police damage estimate £2,400,000. Indonesian government rejects that specific plane following action. Activists held on remand for 6 months in prison, acquitted by jury at trial in Liverpool July 1996. • Jubilee Ploughshares 2000 - Fr. Martin Newell & Susan Van Der Hiden disarm nuclear convoy vehicle at RAF Wittering, England on November 3rd. 2000. Police estimate damage at £32,000. Sentenced to one year imprisonment. 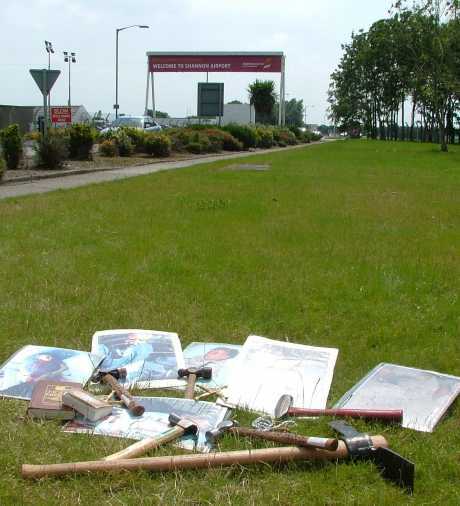 • Pitstop Ploughshares - Deirdre Clancy, Nuin Dunlop, Karen Fallon, Damien Moran & Ciaron O'Reilly disarm U.S. Navy war plane at Shannon Airport in build up to U.S. invasion of Iraq on Feb. 3rd 2003. Plane changes course does not go to war theatre but returns to base in Texas for repair. Does not fly for 2 months. Irish Army deployed to Shannon. 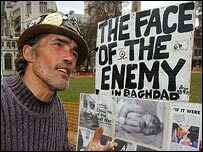 4 U.S. companies transporting troops to build up for invasion of Iraq refuse to land at Shannon as sconsquence of action. U.S. military estimate damage at $U.S.2.5 million. Activists spend varied times on remand in Limerick Prison 1-3 months. Acquitted at third trial at Dublin's Four Courts August 2006. Veteran anti-war direct actionist Ciaron O'Reilly will hold a press conference outside Shannon Airport 12 noon Wednesday July 24th., following the return of hammers used to disable a U.S. Navy war plane at the airport in Feb 03. 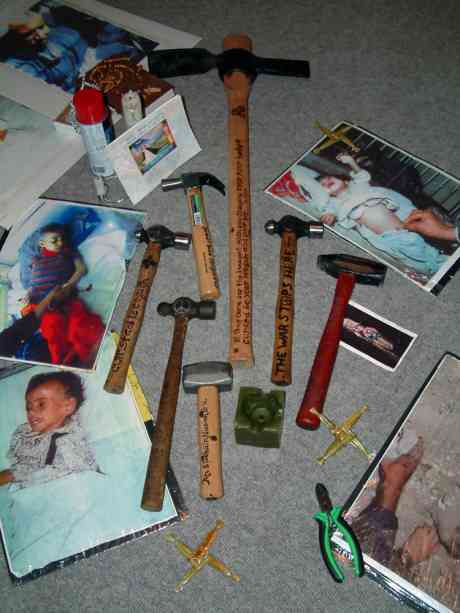 He will bring the hammers and other reurned property to the press conference. O'Reilly was one of the Pitstop Ploughshares group, who along with Deirdre Clancy, Nuin Dunlop, Karen Fallon and Damien Moran were charged with $US 2.5 million criminal damage to a U.S. Navy war plane at Shannon in the build up to the invasion of Iraq. The group were intially imprisoned on remand in Limerick before being put on trial three times at Dublin's Four Courts. They were eventually acquitted unanimously by a jury at the Four Courts in August 2006. The groups action is the subject of Dublin journalist's Harry Browne's forthcoming book "Hammered by the Irish - How the Pitstop Plougshares Disarmed a U.S. War Plane with Ireland's Blessing!". O'Reilly is a veteran of three such Ploughshares actions in as many countries. 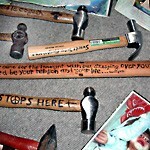 Ploughshares actions take their inspiration from the Old Testament prophecy of Isaiah "to beat swords into ploughshares" and are attempts to disable military equipment employing hammers in an acts of nonviolent direct action. The movement began in 1980 by the Berrigan brothers and other radical Catholic pacifists. Some ploughshares activists have received sentences ranging up to 18 years imprisonment for such actions, while others have been acquitted by juries. Although perceived as a small radical component of the broader peace movement, ploughshares communities have attracted such notable counsel as former U.S. Attorney General Ramsey Clark, present Solicitor General for England and Wales Vera Baird, celebrated human rights lawyer Gareth Peirce and in Ireland they were represented by Hugh Hartnet, Michael Higgins and Brendan Nix. 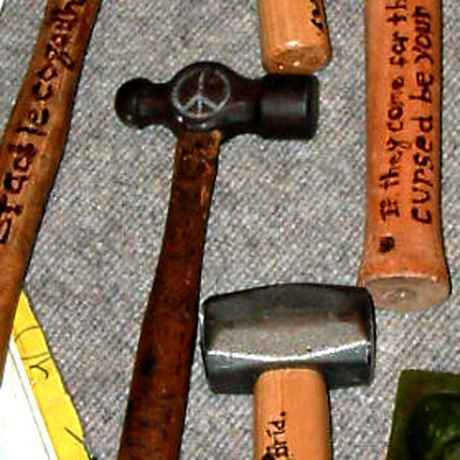 Two of the hammers returned by the Gardai had been used by O'Reilly and the ANZUS Ploughshares group on New Year's Day 1991 when they disabled a B-52 Bomber after breaking into an upstate New York U.S. Air Force Base on the eve of the first Gulf War. O'Reilly served 13 months in a variety of U.S. prisons for that action. One of the hammers being returned has been used on five occasions by various ploughshares groups in the United States, England and Ireland racking up $US 7 million in damage to military equipment destined to contribute to wars in Iraq, East Timor and nuclear weapon systems. O'Reilly stated, "Since we acted five years ago at Shannon Airport over 1 million Iraqi's have been killed in the war we tried to stop. Also 4,000 young Americans soldiers, most who passed through this small departure lounge at Shannon Airport have also been killed and returned home in body bags. Another 20,000 U.S. soldiers, most who passed through Shannon, have returned home with amputations, loss of mind and other injuries from which they will never recover. In the past five years this small civilian airport on the west coast of Ireland has become the central U.S. military hub to refuel its troop movements to the war zone. The hammers, bible, koran and photos we recovered from the Gardai today are in the truest sense "property", what is proper and nourishing of human life. The military equipment that passes through Shannon is anti-property that has destroyed the very infrastructure that sustained life in Iraqi society. President Bush's war escalates in Iraq and Afghanistan, it expands into Lebanon, Somalia, northern Pakistan and soon possibly Iran. The relevant response in these times is nonviolent resistance and solidairty with those who resist whether they are from civil society or within the military itself." and where will it go next? Come see the hammers and other props used in the Pitstop Ploughshares action at Brogans pub (across from Dublin Castle) on Dame st. tonight from 8pm - Queue for a photo with the US $7 million hammer! Hopefully they'll get put to good use again soon. Just an idea but raffling or auctioning some of them off could be a big earner to help in anti-war work. I'm sure lots of people would be interested in it. The state has great respect for "private property" and little respect for the human life of those deemed expendable in the firing line of the moment! The bright side of this gross equation is that there has never been a problem with getting your Ploughshares hammers back once you get cut loose form jail - or on the rare occasion acquitted. In Darwin '99, we rocked up a year after our initial court case and jail time. 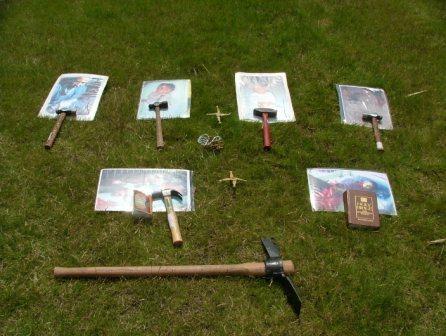 We headed down to the court with no prior notification, identified who we were and a clerk handed over our Jabiluka Ploughshares hammers, not a problem. I came close ot walking off with the ignition entrails of the disabled uranium mining excavator from the evidence box as souvenir until the clerk twigged. 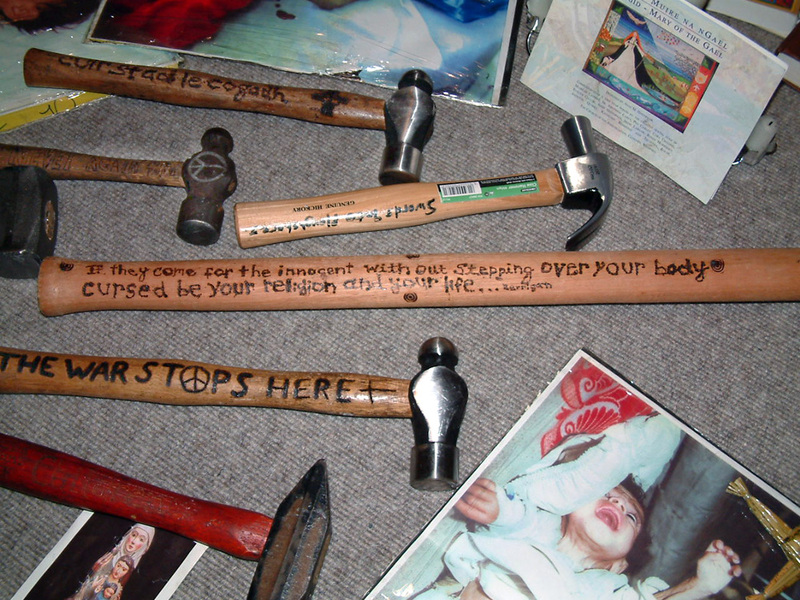 In the U.S. '93, our ANZUS Plowshares hammers were returned by the F.B.I., no questions asked. One of the hammers was passed on to three consecutive Ploughshares communities in England (BAe, Seeds of Hope and Jubilee 2000) before returning to my orbit in 2003 to be used by the Pitstop Ploughshares at Shannon Airport in Feb. 2003. So it was quite a surprise a few weeks ago - given that the law is based on the sanctity of private property and not human life - when I was informed that the Gardai were going to oppose the return of the hammers and I would have to reacquaint myself with Judge Mangan in Ennis Court after a five year absence. On Tuesday, I was contacted to say that the Gardai had folded and there would be no need to front court in Ennis on Friday. They must have realised that they did not have a leg to stand on in terms of property law in Ireland. Detective Hoolihan agreed to meet me at Shannon gardai station to return the hammers Thursday 11am. The detective has a walk on, sit down, off camera role in the film documentary "Route Irish" reading out the PItstop Ploughshares action/faith statement to my wringing wet and exhausted self in the interview room of the same station (in the film it strikes me as playing like a confession hearing that statement read by Irish authorities). It was short notice, so favors were once again requested from good folks who have accompanied us through the action, jail time, three trials and also who have recently arrived on the solidarity scene. So with punk artist Seamus as chauffeur and Catholic Worker nordy Martin as minder on karma patrol - we set off bright and early form Dublin Thursday morning. We had decided to make a public statement against the war with the hammer retrieval but had to cater to the sensitivity of the publicity shy Shannon Gardai. Damien ensconced himself by laptop and phone in Dublin to press release mainstream media, another friend in Budapest was on standby to reach out to alternative media and Limerick local John was all set to chase local journos - once they received THE text that the hammers were back in safe hands. Shannon native Conor and Offaly's own Limerick based activist Margaret were also on standby to swing into action. I always work on the worst case scenario when dealing with authority - prepare for the worst and hope for the best! If you're prepared for the worst, everything else is a bonus. This can be a pretty pessimistic approach so it was great to be in the company of such chilled dudes as Seamus and Mairtin. Things went without a hitch as we rocked up at 11am on the dot. Detective Hoolihan was polite, co-operative and thorough (and let's face it a good loser considering the unexpected result of the PItstop 2006 trial http://www.peaceontrial.com). We went through the list of items, I signed and received a Gardai issued potato bag full of the disarming implements - hammers, bible, koran St. Brigid crosses, rucksack, videos, rosary & Islamic prayer beads and photos of Iraqi children already dying under the sanctions before our Pitstop Plougshares action and the 03 escalation of the U.S. of, now 17 year, war on the people of Iraq. We three headed back to Limerick for lunch as the mainstream media fish seemed to be biting in response to the press releases. Mobile battery was running low as a result of radio, newspaper interviews and various inquiries. 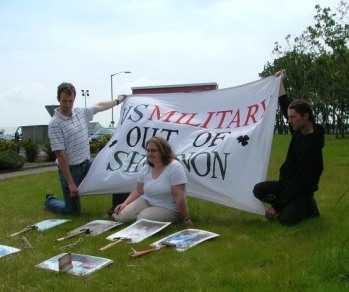 We charged up the phone at a cafe and then headed back toward Shannon Airport for an anti-war vigil laying out the disarmament implements and holding a banner "U.S. Military Out of Shannon". We did some photo ops and a longer interview with Conor. Shannon Airport felt spooky. The last sight of the West by most of the 4,000 young Americans who passed through its small "departure" lounge to their deaths in Iraq. Spooky, too, as I reflected on an Irish society so integral to facilitating the killing yet so disengaged with the escalating and expanding war. Most U.S. troops in Iraq have passed through this small rural out of the way airport. Spooky as I reflected on my own disengagement from the ongoing suffering. Have I, too, learned to live in an Ireland with the transit lounge for death that is Shannon Airport? Thanks for the report. It's a great piece of writing and display of your humanity. You certainly show yourself to being a man who keeps his head "when all about are losing theirs". It's such a shame to see Shannon (after 7 years) still being used to facilitate war/torture/aggression/Halliburton/. O'Reilly just did a firey debate with a Clare Councillor on Clare FM. Other coverage - Clare fm gave it a slot on houly news. "Daily Mail" article and photo P.9 "Justice Takes a Knock" (?!) also has a plug for Harry Browne's forthcoming book "Hammered by the Irish"
I'm glad these were given back and am looking forward to renewing my acquaintance with my hammer and Bible. However, they are only objects, albeit symbolic ones. The main focus must remain the human rights of Iraqis - not to mention those in Afghanistan and of course Palestine. The main goal of a ploughshares action is to look to a future where random violence against whole populations becomes stigmatised and unacceptable. We may not see it in our lifetime but hopefully future generations will carry the torch of this generation of peace activists further, improving the peace movement and how it operates in terms of democracy and solidarity with dissidents. At the moment, there are many problems and many ways in which people who do acts of dissidence are exploited and undermined, the voice of their consciences hijacked and taken over. This is a common experience across many countries (I've had many conversations with activists who have been arrested) and needs to be addressed. I have no regrets about the ploughshares action, having said all of that. However, a peace movement that is at war within itself is never going to end unjust wars, though it may put a dent in the military-industrial complex. On the 2nd anniversary of our acquittal I'd like to say a big thank you to all the groups and individuals who supported us in many different ways throughout the lengthy process. The trials were a great opportunity to highlight the tragic and shameful cost of the Iraq war and Ireland's complicity in it. Today, the irish Times leads with news that the UN Human Rights Committee in Geneva "has called on the Government to establish a regime for the control of suspected rendition flights through its airports". 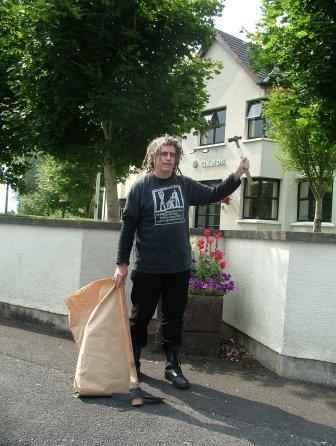 Thanks also to our former lawyer, Joe Noonan, who arranged the return of our property. And thx to Indymedia heads also. Despite the fact that the troops continue to roll through Shannon, it is important to remember, together, we all made a significant contribution to bringing this issue to the fore of public debate in the country. Aug. 10th is the next Shannon Torture Watch vigil at Shannon while I guess there will also be the regular anti-war vigil at the GPO on Monday from 4-6pm. The Catholic Workers 5, Ciaron O'Reilly, Deirdre Clancy, Nuin Dunlop, Karen Fallon and Damien Moran must be congratualated for their tenacity and perseverence in their struggle for justice on behalf of others. However, the struggle for justice in Iraq and Afghanistan and elsewhere must continue, especially at Shannon airport. It has been at Shannon that Ireland's complicity in crimes against humanity have been committed. It should be remembered also that the most of these crimes have been committed after the fully justified direct actions by the Catholic Workers and Mary Kelly. These crimes are still being perpetrated and Shannon airport is still being abused by the US military and the CIA. Gardai and workers at Shannon airport are facilitating these crimes on a daily basis, acting on the unlawful orders of the Irish Government. Today at lunchtime, two US military Hercules C130 warplanes were parked in the central area of Shannon airport. It is outrageous that we should still be allowing these warplanes to refuel at Shannon airport following the unlawful killings of over one million people in Iraq and Afghanistan, and torture of thousand's of prisoners in Guantanamo, Abu Graib, and in countless other prisons elsewhere. We now know that probably most of these prisoners were transported to Guantanamo in US military planes such as the C130s and C5s, rather than the CIA executive jets, that were also used extensively. It is vital, in the interests of humanity and in the interests of justice, that further actions are undertaken at Shannon airport to prevent the ongoing abuse of Shannon as a refuelling stop for aircraft that are invovled in crimes against humanity. them off could be a big earner to help in anti-war work. I'm sure lots of people would be interested in it." displaying some of the evidence at a downtown gallery. not "been put beyond use"! for the purpoe of a specific act of nonviolent disarmament. the Jonah House community www.jonahhouose.org. The U.S.
raid movement of the Vietnam period. Well done Ciaron and bunch! You have valuable relics there. With such valuable relics you will be able to inspire the faith we are so in danger of losing in Eire. 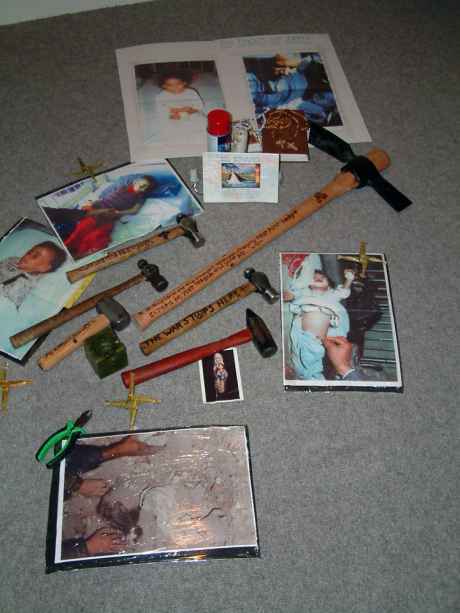 Who knows maybe cures for the sick and needy will in time be attributed to mere contact with the hammers you once used to stop the war in Iraq. Not only now is your eventual place in Heaven assured, but you just might get a beatification and canonisation this side of the end of the US occupation or miitary assistance and supervised extraction of oil from Iraq. "We have to put our own national economic interests first. Charity begins at home. And remember this - if the US couldn't go through Shannon they would just go through a UK airport like Prestwick instead. End result: the length of the war would be unaffected but thousands of jobs at Shannon would be lost - remember that 70% of the airport's revenues come from the US military. Sometimes the price of principle is too high." Miriam's comments above are far too negative and counter-productive. The price of principle and the price of doing what is right is never too high. 70% of the airport's revenues DO NOT COME from the US military, it is probably far less than 7% if the additional costs of security are taken into account. The cost of lack of principle, and the cost of doing nothing to prevent the CIA and US military from using Shannon airport has been over one million dead and thousands of prisoners tortured. We repeatedly tend to underestimate what we can do, and what we can achieve. The Lisbon Treaty results are just one example of what civil society can do, when we put our mind to it. The same rejection of the Lisbon Treaty provides an opportunity to highlight the need to restore Irish neutrality, and to reinstate Ireland's role in promoting international peace and justice through a reformed United Nations. Neutrality as defined by the Hague Convention and customary international law needs to be put into the Irish Constitution, as a basic condition for any reconsideration of the Lisbon Treaty. We also need to insist on the withdrawal of Irish troops from all international missions except genuine UN missions for genuine peace and humanitarian reasons. We also need to stop putting the interests of a few hundred jobs and workers at Shannon airport before the lives and suffering of millions of innocent people in Iraq, Afghanistan and elsewhere. Have to agree with Edward's response to Miriam's post. The anti-war movement, which is huge and has spread to practically every town and village worldwide, is testament to the fact that many people simply can't be bought off in this way. WELL DONE ALL , I think some of the pictures and hammers should be displayed outside leinster house as Brian Haw's stall outside englands house of commons is greatly effective , and opens up a debate with the public. So many dead - so few images? the Irish would have to embrace what theyhave been doing for the last 5 years. the jury is still out on whether the pece movement has learnt anything from Vietnam or Gulf War 1. Maybe because the turnover in the peace movement is way higher than those who serve in the miltary. Or disengagement by those who marched on Feb 15 03 is higher than those who marched off to war? effort by the American military to control graphic images from the war. forbidden to work in Marine Corps-controlled areas of the country. Maj.
the world. Mr. Miller has since left Iraq." There seems to be some confusion here. The comment I posted is a quotation - I think the attitude it demonstrates is grotesque but it does show how some people think about what is happening in Shannon. It's silly to suggest that it shouldn't be discussed - and sillier again to imply that merely by quoting it, it constitutes some sort of slur on the anti war movement. There are far more people around who think like this than it may be comfortable to contemplate and unfortunately it is their attitude that is prevailing at the moment. No use sticking heads in the sand about it. The comments by both Miriam and Anti-War Activist above have considerable validity, and I dont doubt their sincerity. However, it is essential that we focus more on what we can do, and what we should do. Following public opinion is a poor basis for doing whats right becase it is right. See my indmedia article on some of what is going on at Shannon at present. I agree that most members of the public simply just dont want to know about these things. However, those of us who do know have a duty to act on that knowledge, and those who dont know, have a duty to find out, if crimes and human rights abuses are been committed or facilitated in our names. Talking the talk is useful, but is no longer enough. It is time for all of us to walk the walk at Shannon airport, and to do what each of us, individually, considers should be done to prevent these crimes against humanity being committed. The next peace vigil is at Shannon airport on Sunday 10 August from 5 pm to 6 pm. However, each of us should feel free to go to Shannon at any time, day or night, and make our own individual or group protests, or take whatever actions we consider appropriate to prevent crimes being committed. The reason that I posted the article on present events at Shannon is that there is a likelihood of an attack of some sort on Iran between now and next January when the new US president takes over. This is likley to be an Israeli attack with considerable US airforce and intelligence support. Because August is the holiday month throughout the US and Europe and elsewhere, such an attack would pass off with least public protest. August or December are the two likely "windows" for such an attack. The heavy transport US military planes that are passing at present may mean that stockpiles of munitiions are being delivered to Israel, or to US bases in the region or both. The AWAC Boeing that passed over on Sunday is one of the type of aircraft that would be used to provide air forces air traffic control, target acquisition and direction and other services over the attack area. If such an attack occurs it will be faciliated by free movement through Irish airspace, and refuelling at Shannon airport. If this happens are we to do nothing except post articles on Indymedia? Hopefully we will see Peace Activist and Miriam at Shannon on 10 August. We are also planning a larger peace demonstration at Shannon airport on Saturday 13 September at 2 pm. But dont wait for someone else to organise a protest at Shannon. Walk the walk and organise one yourself. "However, it is essential that we focus more on what we can do, and what we should do." The Catholic Workers pulled off a great thing here with minimal resources and personel. The irony of the Gardai having to (re)equip the ploughshares movement made my day. I'm sure it didn't make theirs. 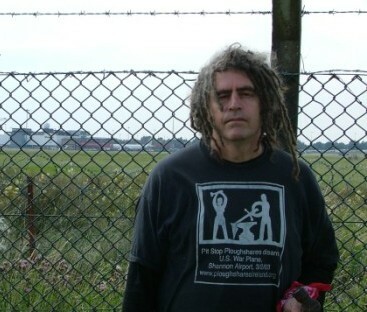 Recent history shows that there are likely to be plenty of activists in Scotland who are prepared to enter the airfield at Prestwick and to board American military aircraft landing there in search of evidence of war crimes, as they did on three different nights in August 2006. Charges against three peace activists who protested about weapons transportation at a Scottish airport have been dropped. The trio were due to stand trial on 19 October charged with breaching air navigation orders by behaving in an abusive manner at Prestwick Airport. But the Crown Office said that no further proceedings will be taken. Officials said that charges had been dropped following further consideration of the available evidence. Roz Bullen, from Edinburgh, Sylvia Boyes, from Yorkshire, and Kate Holcombe, from Worcestershire, were charged following the incident on 6 August last year. They were among a group of peace protesters who entered the Ayrshire airport during three consecutive nights of action in August 2006. On Friday five people, who in August along with 12 others carried out inspections of Prestwick Airport to look for evidence of US munitions bound for Israel for use the Lebanon conflict, were acquitted of all charges against them at Ayr Sheriff Court. Ludwig Appeltans (35) from Belgium, Richard McKean (38) from Glasgow, Joe McLoughlin (35) from Perth, Pippa Robertson (21) from Edinburgh and Anna-Linnéa Rundberg (26) from the Åland Islands in Finland, were in the airport grounds on the night of the 6th and 7th August for around 40 minutes before being apprehended. They went on board a USAF C130 Hercules aircraft and examined a Polar Air plane. There is probably nowhere in western Europe these aircraft can land without protest. 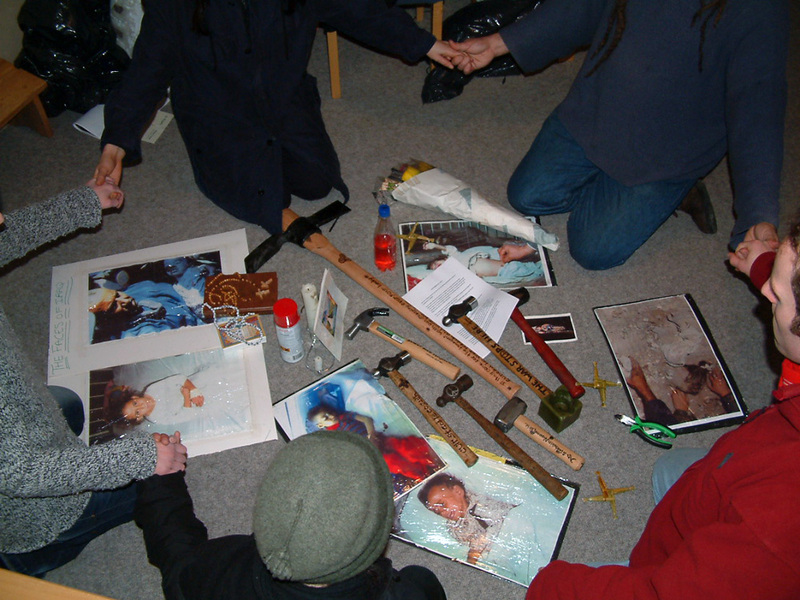 From memory the above action at Prestwick happend within a week of the Pitstop Ploughshares acquittal in August 06. Around the time the Raytheon 9 undertook NVDA in Derry. Along with the last week of our last trial, these actions took place in the context of the Israeli (cluster) bombing of Lebanon. The resupply flight intended for Shannon was refused permission to land (how much a unanimous acquittal of resisters factored into an Irish government decision - that resupplying the Israeli military was a bridge to far this particular weekend, dunno?) The resupply plane was then redirected to Prestwcik. The Trident Ploughshares movement happened to be encamped at Faslane for their annual Hiroshima day NVDA. Trident Ploughshares had the creativity and flexibility to respond to the esupply of the then bombing of Lebanon and on shortnotice headed for Prestwick, rather than the well defended Faslane Trident base as expected. The activists compromised "security" in their plane inspection. I thomk of one of the activist inspectors was arrested seated in the pilots seat! A few days later another U.S. (to Israeli) munition resupply plane bypassed Shaanon and headed to Prestwick. There were so many anti-war protesters at Prestwick that it was redirected for a third time to RAF Middenhalll before landing. Not welcome at Mildenhall either! As Ciaron says, a US military flight suspected of carrying arms for Israel during the war in southern Lebanon in August 2006 was diverted from Shannon to Prestwick to RAF Mildenhall. Members from the Campaign For Nuclear Disarmament (CND) are considering setting up a permanent camp outside an airbase in Suffolk. Campaigners have staged demonstrations outside RAF Mildenhall against the refuelling of US flights to Israel. The protesters have said the planes are carrying bombs. The Foreign Office (FO) said on Tuesday that, in future, the planes will be allowed to land only at military airfields in the UK. The flights were diverted to RAF Mildenhall to avoid protesters at Prestwick Airport in Scotland. There is probably nowhere in the UK where US military flights can land unnoticed or unprotested, and in fact there are probably more protesters available in Scotland, England or Wales. So if we drive them out of Shannon, it will be more difficult for the US to conduct its neo-colonial campaigns in the Middle East and Central Asia. Judge says "It's about Time!" to Catholic Workers Attempting to Arrest Karl Rove for War Crimes! by Frank - Des Moine Catholic Worker Fri Aug 01, 2008 05:01 Des Moines, Iowa, U.S.A.
asked Shaw, "Mamn, what were you doing at the Wakonda Country Club?" "Well," the judge looked up and said, "it's about time." defendants or the Des Moines Police are inaccurate. A feature article appears in this week's edition of "The Irish Catholic" (Page 19) regarding the hammer pick up. Helpfully it concludes with the email contact for the Dublin Cathoic Worker, the international CW website www.catholicworker.org and a promo for Harry Browne's recently (Countepunch/U.S.A.) published book "Hammered by the Irish - How the Pitstop Ploughshares Disabled a U.S. War-Plane with Ireland's Blessings!" Catholic Workers along with members of Andrea and Mairtin's family, members of Dublin's Colombian community attended the baptism of our "latest recruit" Santiago yesterday. Preceedings concluded with Robbie wandering down the aisle singing a lullaby in Irish and presenting Santiago with an African baptismal drum. along with other artists yet to be hunted down and confirmed! and a short talk by the author or someone who has read the book. -Entry by donation to Anti-War Prisoners or War Resisters presently fronting the courts. There will be more formal launches of Harry's book around the country as the remainder of the year unfolds (or unravels!). If you are interested in organising launch in your town on your campus make contact! and dissident memory, to fuel further anti-war resistance. I'll be at the Dun Laoirighe Festival and Electric Picnic if anyone wants to chat about this stuff. Also "Route Irish" will be screeened at the "Stranger than Fiction" fetsival in Dublin at the end of September. This is an example of archiving resistance check out the Milwaulkee 14 napalming/burning of draft files in the '60's. More on Milwaukee 14, Where are They Today? & Anti-War Resistance in Milwaukee Today! today on this web page. science at Marquette University Today. in Milwaukee area at MU is the new draft board for military officers. resistance to military at MU.